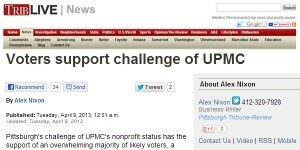 A recent poll conducted by the Tribune-Review showed that 76% of registered democrats support the city’s challenge to UPMC’s tax exempt status. In his March 20th press conference announcing the tax challenge, Mayor Luke Ravenstahl estimated that if UPMC paid the 0.55-percent payroll tax and property taxes, it would contribute an additional $20 million a year to the city. In 2011 UPMC’s federal, state and local tax breaks cost taxpayers $204 Million dollars. That is enough money to cover the deficits of the Port Authority, Pittsburgh Public Schools, and still have left UPMC with large profits. 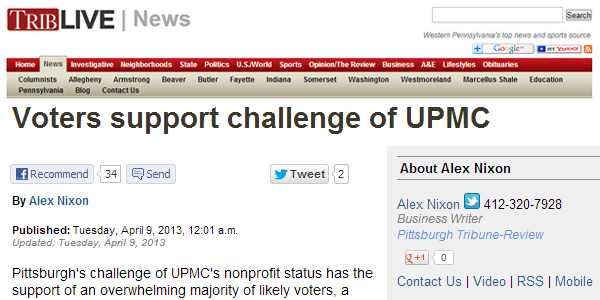 That is big money that should be used to better our communities, and is one more example of how UPMC is not a charity. Read the full Tribune-Review article here.